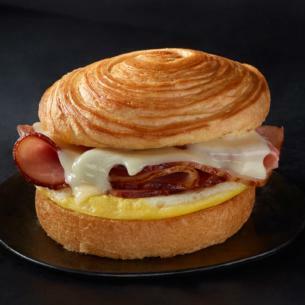 We elevate the ham and swiss standby to a sandwich you can't pass up: Maple ham, creamy Swiss cheese and a fluffy scrambled egg on our signature croissant bun. orange cranberry croissant (enriched wheat flour [wheat flour, malted barley flour, niacin, reduced iron, thiamin mononitrate, riboflavin, folic acid], water, butter [cream (milk), natural flavor], sweetened dried cranberries [cranberries, sugar, sunflower oil], sugar, orange flavedo [orange peel zest, cane sugar, orange oil essence], yeast, sea salt, eggs, wheat gluten, xanthan gum, ascorbic acid, enzymes), egg patty (egg whites, egg yolks, milk, food starch- modified. contains 2% or less of the following: salt, citric acid), maple sugar ham (cured with water, vinegar, maple sugar, salt, brown sugar, sugar, sodium phosphate, maple flavor [caramelized sugar syrup, flavorings, maple syrup, brown sugar], sodium ascorbate, sodium nitrite), turkey gravy (water, cream [milk], onions, turkey broth concentrate [turkey stock, natural flavor, salt, turkey fat, sugar, maltodextrin, yeast extract and stabilizer (xanthan gum, propylene glycol alginate)], bleached flour [wheat flour, malted barley flour, niacin, iron, ascorbic acid, thiamin mononitrate, riboflavin, folic acid], butter [cream and salt], chicken broth concentrate [chicken stock, natural flavor, salt, sugar and yeast extract], corn starch, turkey fat, whey protein concentrate, expeller pressed canola oil, caramel coloring, gum blend (xanthan gum, guar gum, carrageenan), sage, black pepper, dried thyme, rosemary, bay leaves), cranberry apple fruit spread (cranberries, apples [apples, ascorbic acid, citric acid, salt], sugar, water, brown sugar , apple juice concentrate, apple cider vinegar, canola oil, pectin, natural flavor, spices, potassium sorbate [preservative], ascorbic acid, salt).